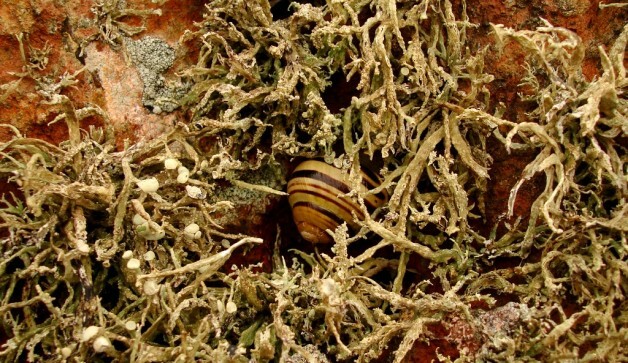 Dr M has been investigating lichen diversity with his MSc students and has recently posted on liking lichen growth forms, crustose lichens and foliose lichens. Dr M continues this series with a look at some of the fruticose lichens that students examined in the lab under the expert guidance of botanical colleague Fay Newbery. 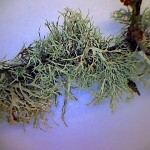 The thallus (the main body of the lichen) is branched the branches may be rounded or flattened and there is no differentiation between upper and lower cortex. The algal cells are in the outer layer of a loose medulla region. 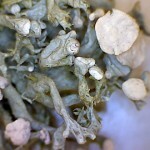 The whole lichen is affixed to the substrate at one point called the holdfast. The descriptions of the following species are modified from Frank Dobson’s remarkable book: “Lichens an illustrated guide to the British and Irish Species”. 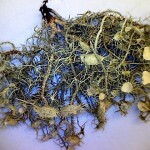 Ramalina farinacea. The genus name means “branch or twig” from the shape of the thallus. Thallus pale grey-green to yellow-green, flattened and with rather narrow branches (to 3 mm wide) often weakly channelled to about 5 cm long arising from a compact holdfast. Farinose (flour-like) soredia occur on the margins of the thalli. Common on nutrient-rich bark. 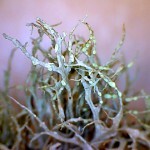 Ramalina fastigiata. Thallus erect and tufted and up to 5 cm long. Lobes very branched, wrinkled, rounded or flattened, often swollen, bearing many apical apothecia that may almost conceal the thallus. Common on well-lit nutrient rich bark. Usnea florida. The genus name means rope-like. 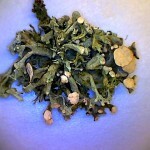 Thallus grey-green, erect and up to about 5 cm. 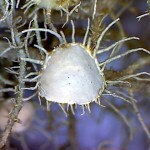 The main branches are coarse and with minute warts and small spines, to 1 cm long. There are no soredia or isidia. The medulla is narrow with a stout central core. Apothecia are large (up to 1 cm diameter) fawn-coloured and surrounded by ray-like spinulose branchlets to 5 mm long. The disc is concave becoming flat and slightly wrinkled with age. Common on tree canopy twigs and branches especially in old woodland mainly in the south and west. The material we looked at was not from Reading but from Exmoor. Getting interested in lichens? Why not check out the British Lichen Society who always welcome new members and interested beginners into their lichenological fold! The featured image at the top of this post is Ramalina siliquosa growing on coastal rocks at the Lizard peninsula, Cornwall.